And officiating the ceremony was none other than the man who nearly died at the hands of the groom—Mike Rinder. Strange? Yes. But the one minor detail that transforms this one from bizarre to downright creepy is the fact Rinder isn’t actually a minister. That is not a comment on his less-than-“saintly” reputation, but rather that he has no authority to marry anyone anywhere, except in the delusional world of Marty Rathbun and his followers. Nonetheless, Rinder stepped up to his make-believe pulpit wearing a Cuban shirt and a smirk and proceeded with the nuptials. Adding yet another layer of “is this for real?” to the scenario, Rinder’s “wedding sermon” extolled the virtues of his “best good buddy” with the following: “Marty is perhaps the finest example I have ever met of someone who maintains personal integrity.” Quite a glowing tribute to the man who not only beat him to a pulp but who, exactly one week later, would be locked up in a jail cell in New Orleans. The circumstances are these: after the Rathbun wedding—or whatever it was—Marty and Mosey took off for a honeymoon. They did not embark on a grand tour of European capitals. Nor were they headed to an intimate getaway basking on sun-soaked beaches. No, their destination of choice was the city Marty refers to as the couple’s “favorite steam-release venue,” The Big Easy—New Orleans. Consequently, he and his new bride made their way to the heart of the French Quarter for their last honeymoon hurrah. They landed in a watering hole called Funky 544 at the corner of Bourbon and Toulouse Streets. After a night of partying like it was the last Mardi Gras on earth, some time around midnight an intoxicated Rathbun stepped outside for some “air and space.” Ever the thoughtful one, especially when loaded, he omitted to inform his newlywed bride of his sudden departure. What happened in the ensuing hour and a half will never be known for certain. What is known, however—and, in fact, is a matter of public record—at approximately 1:30 am, Marty returned to Funky 544. He was shirtless, dead drunk and, when the bar’s bouncer politely refused him entry to the club, he became belligerent and abusive. As Rathbun’s tirade escalated, the Funky 544 staff followed procedure and called the cops. And so it was a short time later a pair of New Orleans mounted police arrived on scene. 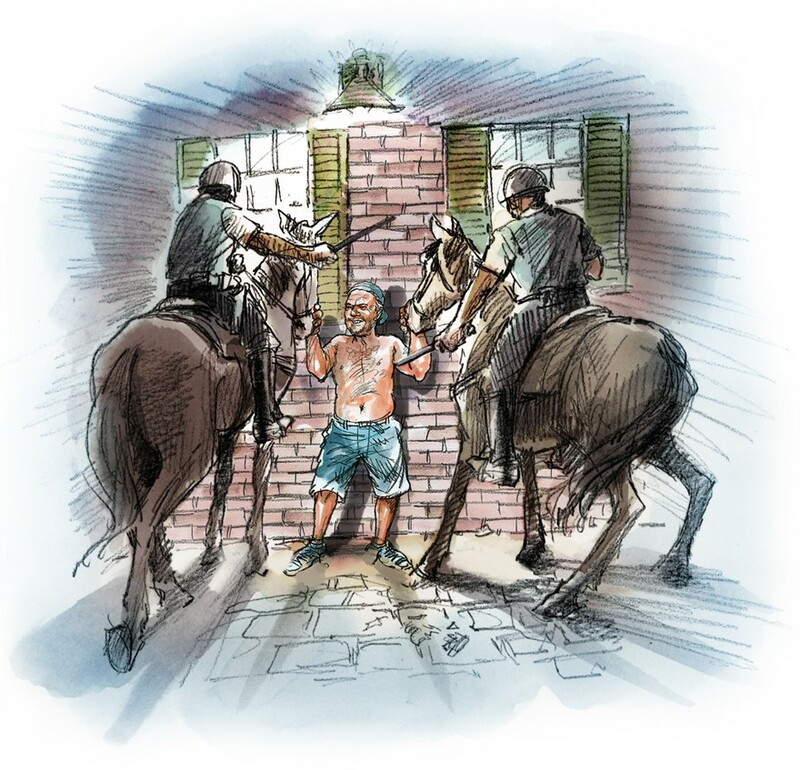 As they approached, Rathbun turned his rancor on them, whereupon the officers likewise followed procedure, closing in on the drunk and pinning him to the wall with horses specially trained for crowd control. After which, Rathbun was handcuffed and escorted to the Orleans Parish Prison. 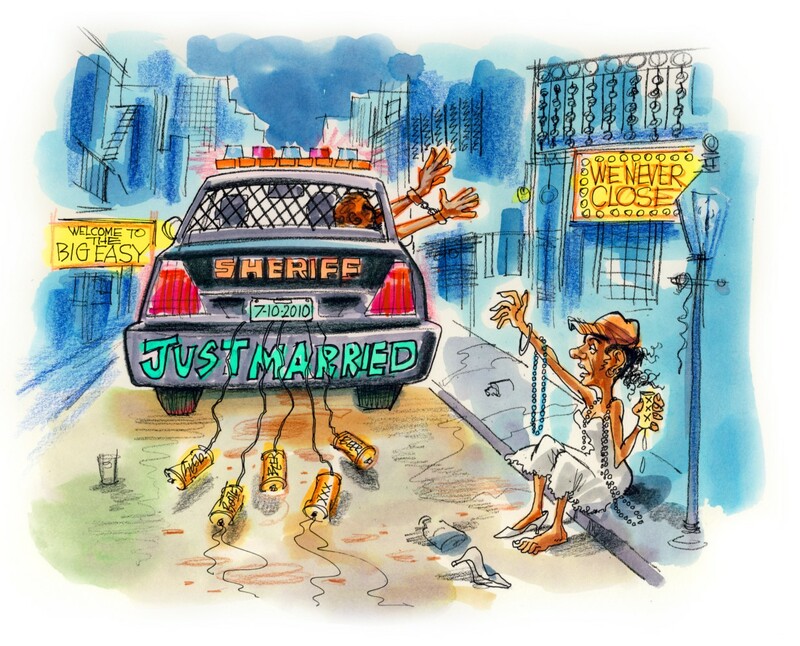 Meanwhile back at Funky 544… if the bride was heartbroken her “better half” deserted her on the last night of their honeymoon, she didn’t let on. In fact, by all accounts, Mosey didn’t even notice he was gone. As one witness later recounted, the newlywed Mrs. Rathbun was so intoxicated other patrons were groping her as she danced. But before things got further out of hand, so to speak, a waitress took pity on the woman and pulled her off the dance floor. It wasn’t until several hours later that Mosey learned her husband’s whereabouts—about the same time he snapped to and remembered that he’d left her behind. At which point Mosie turned to Jason Beghe, the Posse member with the most experience with such matters, given his string of similar “run-ins” with the law. By the following afternoon, Beghe had posted the $300 bond and the “finest example” of “personal integrity” walked out of the Orleans Parish Prison, albeit hung over. The honeymoon was most definitely over, but the story doesn’t end there. For one week after the New Orleans misadventure, a presumably dried-out Rathbun posted a “confession” about his lost weekend in Louisiana. That it was an exercise in delusion and monumental justification is an understatement. Among the many claims Marty made in his declaration was that he’d been blindsided, blaming the waitress for not warning the unsuspecting couple she was serving 180 proof alcohol. In truth, the only hooch packing that kind of potency is old-fashioned moonshine or pure grain alcohol. While the bar is famous for its powerful cocktails (it is on Bourbon Street in New Orleans, after all), unlike grain alcohol, their drinks aren’t highly flammable and won’t cause blindness. The Funky 544 waitress later said she recalled Marty and Mosie ordering a steady stream of “100 proof shots” that night. Moreover, she told the couple precisely that when they came back to the bar the following day. (Marty and Mosey presumably returned to the scene of their bacchanal attempting to reconstruct the evening through eyewitness accounts so they’d have something by which to remember their honeymoon.) Somehow “100 proof” became “180 proof” and Marty’s lethal drink-pushing scapegoat was born. Rathbun’s blog entry further claimed he’d lost his shirt in an impromptu one-on-one dribbling contest with a “kid” on Bourbon Street. Again, the story that springs from the mind of the psychotic Rathbun doesn’t quite match up with reality. First of all, the aforementioned “kid” is a thirty-something airline employee who moonlights as a basketball dribbling street performer. Secondly, the fateful evening of July 10, the “kid” had packed up his ball between 7 and 8 p.m.—a full 4 hours before Marty claims to have challenged him with his b-ball dexterity. And finally, the street performer told Freedom he never lets anyone lay a finger on his prized basketball. So Rathbun’s account was all true except for what occurred, when it occurred and with whom it occurred. Indeed, Marty’s online mea culpa placed responsibility everywhere except where it belonged. For he also pointed the finger at the bouncer for not letting him back in Funky 544 and the person who must have walked off with his shirt at the fictitious dribble showdown. And while he didn’t actually say it in so many words, implicit in his “confession” was that it was the boogieman who got him into this mess in the first place. By confessing to everyone else’s role in his night of debauchery, Marty “Steam-release” Rathbun apparently absolved himself of any sin. He even forfeited Beghe’s $300 bond to “expunge” his criminal record. So, in the world of Marty Rathbun, delusional psychotic, none of it really happened. But in the real world, the one the rest of us live in, it all very much did. As proof of that there is one piece of evidence Marty can’t make disappear because the mug shot of him in that orange Orleans Parish Prison jumpsuit will never go away.